In my previous blog entry, I wrote about some of the evidence for goal setting and the considerations for using it properly to be effective. Today, in this second part of a three part series on goal setting for runners, I am going to cover some of the most important evidence based underlying principles for goal setting. Then I’ll finish this series off with my third piece on how to actually devise a system to set goals to enhance your running performance and/or enjoyment. Facets of this are going to remind you of the classic SMART goals strategy which is very well know, highly regarded by many and well worth researching and investigating if you do not already know about it. I hope it came across in my previous article, that the evidence and research on goal setting suggests it can enhance performance and our general development as a runner when used properly. I also hope that it came across, that goal setting is not universally effective in every way for every runner. Different types of goals for different types of activities will vary depending on the runner. Some goals will enhance motivation, some will help a runner persist in the face of adversity, and some will let the runner feel more in control of some goals than others. Throughout the literature and research though, some key points stand out and are consistent considerations when setting goals if you wish them to help you advance. Firstly, goals produce higher levels of performance enhancement when they are specific than if someone is simply attempting a goal of “doing their best” (Weinberg & Weigand 1993). Those club coaches, fellow runners or family members who tell the runner that they go out there and “do their best” might feel motivated, but it is not as effective in getting the runner motivated and performing better as it is to encourage them to go out and achieve a particular and specific goal. Additionally, for me as an evidence based hypnotherapist who employs a lot of Cognitive Behavioural processes within my therapy rooms, it is a tendency of mine to prefer to use therapeutic interventions that can be measured. We set therapeutic goals along the way and measure our progress towards them each session – likewise, specific goals when it comes to running are goals that can be measured. As runners, we may well want to become faster or fitter or slimmer, but these are all vague, generic goals. Taking 5 minutes off your personal best 10k time within the next 8 weeks, or being able to run 10% further in the same time within 16 weeks are more specific and measurable goals that are more useful for the runner. The next principle is one that requires some thought and consideration – that goals ought to be challenging, with a good level of difficulty, but ultimately attainable (Locke and Latham, 1990). If a goal is too easy, it may not present a challenge and not result on the full effort being invested by the runner. This can also therefore lead to average performances instead of pushing ourselves in training, subsequent races or events. Of course, on the flip side of that, is that if the goals set are too difficult or just unrealistic, they can result in failure and subsequent feelings of defeat, lack of motivation and lowered belief in oneself. So when setting running goals, the runner will benefit from striking a balance of aiming to improve and achieve the desired successful outcomes, whilst avoiding pressure and potential failure by keeping the goal realistic and suitably challenging. From my own point view, I have found the balance hard to strike sometimes. After a couple of years off running in the early 2000s, I subsequently got back into running, ran London marathon in 4hrs 30mins that season. The next year I ran London marathon in just under 4hours, then the subsequent year I ran it in 3 hours 15 minutes as I trained harder and better, I also found making gains tougher. When you are a 14 stone man, then thinking of taking another 15 minutes off your marathon time to get that golden fleece of a sub 3 hour marathon would be some feat and required a lot of consideration before setting that goal – I was not getting any younger either! It is a tough balance that requires healthy, intelligent consideration. Previously, I mentioned how long term goals can seem less compelling. A runner may be running just because he wants to reduce his weight by 4 stone in the next year. That year can seem like a long way away. Likewise, I used to set myself targets for each marathon season, culminating in the time I wanted to run the marathon in that year. I think a lot of people set these kinds of longer-term goals when they start. The research suggests that having short-term goals as well as those longer-term goals will enhance motivation and performance more effectively (Weinberg et al., 1993, 2000). Short term goals can give us good indicators of the progress we are making, they give us success along the way, they give us measurable evidence that we are progressing toward that longer term goal and can be more compelling. With running, having a weekly and monthly objective and goal that is specific, can really help us notice our improvement and let us get on with those training schedules where the end seems a long way off, especially if you are training in poor weather conditions in Winter, for example. With my own goal setting for running a sub 3 hour marathon, I would set weekly mileage goals, as well as having particular pace goals and time goals for each and every run, which I think is pretty much the way most people train for marathons. With the emergence of GPS running watches (how I love my Garmin 610), it is made so much easier. However, prior each run I get focused, really tune in to my objective for that run and make it a specific, short term goal. I knew that if I simply kept on achieving these short term goals with this much regularity, then my longer term goal would be made easier, more attainable and more realistic. Gould (1988) stated that many athletes find it easier to get motivated and ready for a game, competition or event, than it is to get motivated for training. 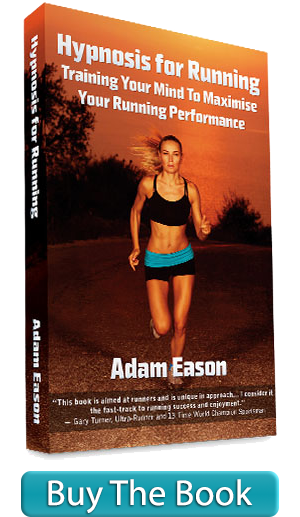 I know runners who are well pumped prior to races, but struggle to train with consistency. Therefore, as well as long and short term goals, make sure you have goals for training as well as just for your race performance and specific longer term outcomes. Goals set for training can help apply some healthy pressure similar to that experienced with races – I know the runners at my club that are goal oriented at training really have some pressure on them for the final speed interval or that final mile to make sure they hit that training goal. FIlby et al. (1999) showed that goals set for training are just as important as those set for races and competitions. Get your goals written down. This is not just supported by sport psychologists (Gould, 1998; Weinberg et al., 2000) but also other published psychologists and therapists. The research tends to suggest that if the goals are written and then displayed where they can be seen, goals set will be more effective in enhancing performance. Remember in the boxing films, the boxer had his opponent’s photograph pinned to his mirror? I keep my long term goals on paper pinned to a mirror despite my wife’s protestations and I keep another pinned to the noticeboard beside my work desk in my office. The idea is to keep the goal visible and to keep it in mind. Sometimes goals get swept away in the midst of training or end up stuffed in the bottom of a kit bag or at the bottom of a drawer, we want to keep them fresh in our minds. Previously on this blog, I mentioned Locke (1968) wrote that one of the key benefits to goal setting in sports was that it helped develop learning strategies. With runners therefore, we need to look at what we can be doing to advance our skills, technique, mindset, endurance and anything else required to help us achieve our goal. A runner might read about technique, or get a coach to look at their technique, or see a physiotherapist. A runner might look at ways to recover more effectively after training runs. A runner might look at understanding nutrition to best fuel the new levels of exertion. A runner might look at other means of training, perhaps using hills, or a track for speed sessions, or working on the arm swing to generate pace in speed sessions. You see the wide variety of ways we could look at learning how to improve our chances of achieving our goal. So rather than letting it become a bi-product of our goal setting, it is recommended that the runner actively pursue ways and means of developing new strategies to enhance performance. The research, studies and literature do show that goals are helped greatly by social support when it comes to us keeping driven, motivated and overcoming obstacles to success (Albrecht and Adelman, 1984; Cohen, 1988; Hardy, Richman & Rosenfeld, 1991). One study in particular demonstrated that having the support of your spouse, having told them of the goal and advising of ways the spouse can help support, is a great way to get the goals achieved. As well as helping to encourage you and hold you accountable for the goal, you also then have an outlet of discussion if you wish to discuss any struggles you encounter working towards the goal. Finally then, we look at goal evaluation. This is having a way of assessing what you did with your previous goals. Locke (1981) found that getting accurate feedback was important in sports, but those of us without coaches or people to derive feedback from in any detailed fashion, can look at being reflective and applying some sort of critique to how it went, what you did, and what you can do different next time. This is going to help you with setting your next set of goals too. In my consulting rooms, we (my clients and I) often look at Problem Solving Therapy (PST) as a means of assessing a problem and putting a plan in place to overcome it. The same strategy of reflecting intelligently and considering what do differently next time (if you plan on doing anything different at all) is an important part of making the most out of goal setting. I have not written in any detail about having specific outcome goals as this blog is not really aimed at elite runners – but aiming to win races, or beat other runners in races is a proven way of enhancing performance (Kingston & Hardy, 1997; Orlick and Partington, 1988). However, for the rest of the running community, having well formed, specific goals aimed at your own performance is going to be what helps enhance your running results and enjoyment. I really hope this is getting your juices flowing and getting you thinking about how you’ll think about your running goals. I’ll be back next time writing all about how to actually set up your own goal setting system so that you run faster, better and further. Albrecht, J. L., & Adelman, M. B. (1984). Social support and life stress: New directions for communication research. Human Communications Research, 2, 3-22. Gould, D. (1988). Goal setting for peak performance. In J. Williams (Ed. ), Applied sport psychology: Personal growth to peak performance (pp. 1820196). Hardy, C. V., Richman, J. M., & Rosenfeld, L. B. (1991). The role of social support in the life stress/injury relationship. The Sport Psychologist, 5, 128-139. Kingston, K., & Hardy, L. (1997). Effects of different types of goals on processes that support performance. The Sport Psychologist, 11, 277-293. Locke, E. A., (1968) Toward a theory of task motivation incentives. Organizational Behavior and Human Performance, 3, 157-189. Locke, E. A., & Latham, G. P. (1985) The application of goal setting to sports. Journal of Sport Psychology, 7, 205-222. Orlick, T., & Partington, J. (1998) mental links to excellence. The Sport Psychologist, 2, 105-130. Weinberg, R. S., & Weigand, D. (1993). Goal setting in sport and exercise. A reaction to Locke. Journal of Sport and Exercise Psychology, 15, 88-95. Weinberg, R. S., Burton, D., Yukelson, D., & Weigand, D. (2000). Perceived goal setting practices of Olympic athletes: An exploratory investigation. The Sport Psychologist, 14, 280-296. Thanks for this post! Good point regarding short and long term goals! I find it’s quite daunting to look ahead at my marathons coming up in Jan and Feb and indeed at the lengths of some of my training runs between now and then, but if I focus on just the next run or the next couple of training sessions it doesn’t seem so scary or strenuous. Interested to see you rate the Garmin. Does it allow you to download the graph of your HR as well? I have to track my HR on my Polar FT80 and my distance/pace on my phone so combining the two before race day may be on the cards. Hello Ben, great hearing from you, as always. I think your comments about marathon training, and the very nature of it are very common among marathon runners in particular. So yes, short term goals punctuating that training period become highly useful and keep us right on track. I love my Garmin 610. It does come with its own HR monitor, but I don’t use it. I am a major statto so download all my training runs and races onto my Mac to stare at for hours afterwards. In some of my race reports here, I have uploaded the maps, graphs and race report from my watch following the race – you can see the pace slowing with the hilly miles at Brighton marathon for example.